Unlike Antarctica, which is a land based continent surrounded by an ocean, the Arctic is an ocean surrounded by the continents of North America, Europe, and Asia. During the winter, much of the Arctic Ocean will be covered with sea ice. In the spring some of the ice will melt. Traditionally, much of the ice remained throughout the summer. Ice that survives multiple years grows thicker and provides a critical habitat for many species. 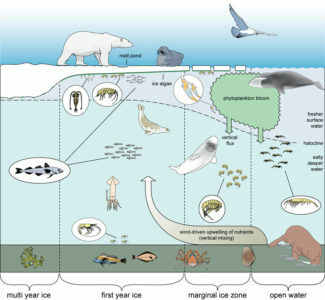 The edges of sea ice are biologically active. Algae grows on the bottoms of ice shelves and becomes active areas for fish feeding. When sea ice melts, nutrients are released into the water. In combination with sunlight, plankton blooms are triggered. Bowhead whales feast on seasonally abundant phytoplankton zooplankton. Narwhal, beluga, seals, and larger fish feed on small cod and krill that grow in abundance at the edges of the ice. Sea ice can be used by marine mammals in many different ways. Seals “haul out” on sea ice to rest, breed, and nurse their pups. Polar bears feed primarily upon seals. They take advantage of resting seals or the seals need to breath air through holes carved in the ice. Polar bears are completely dependent upon the ice to reach their prey. Walruses too depend upon sea ice to reach their food supply. Moving ice flows carry them over the shallow muddy bottoms of the Arctic Ocean where they feed upon benthic organisms such as clams, cockles, and mussels, worms, and sea cucumbers. Image from Norwegian Polar Institute. The Arctic is warming at nearly twice the rate of the rest of the planet. The Earth is warming, but since 2006, the Annual Arctic Report Card — a compilation of recent research from more than 60 scientists in 13 countries, has found that the Arctic is warming almost twice as fast as the rest of the planet. This has been described as “Arctic Amplification,” and it is based on the watery nature of the Arctic. Snow and ice reflect most of the sun’s energy back into space. We say that it has a high albedo. Under normal conditions, an ocean full of winter sea ice reflects the sun’s rays and resists changes in temperature. However, as the Earth has warmed and sea ice has melted it revealed a dark blue ocean. That dark blue absorbs much of the sun’s energy instead of reflecting it. Think of a car with a dark interior on a sunny day – it can get pretty hot, even on a “cold” sunny day. Global warming means less ice in the Arctic; and less ice means more warming. This is a positive feedback loop, one action reinforcing the second. To give you an example of Arctic Amplification, in the fall of 2017, sea ice in the Chukchi Sea was extremely late. This meant that the town of Utqiaġvik (formerly Barrow) was unusually warm. However, in November 2017, it was so much warmer than normal that the computer algorithm labeled the data as an error. After scientists checked all of the equipment, there was no error, just a demonstration of what ice (or lack of ice in this case) will do to the local climate. Weather and climate are not the same things. It’s important to note the distinction. Let’s say that outside our classroom, its really cold out, maybe the coldest day this year, maybe even the coldest day this decade. Does that mean that the global warming is not real? What it looks like outside our classroom window right now is weather. Weather is variable, weather is local, weather is immediate. At any given location temperatures, barometric pressures, and precipitation changes from day to day. When we talk about climate and climate change we are talking about trends that stretch many years over large areas. In the Arctic the set in of winter sea ice now comes weeks or months later than it once did. Each year it varies slightly, but the trend is well established. According to NASA the extent of sea ice left in September, what we call the sea ice minimum, is decreasing at a rate of 13% per decade. Scientists have been able to study glacial ice cores from the Arctic. The cores can show us what temperature and precipitation was like hundreds and thousands of years ago. Based on these studies we can make conclusions about the climate of the Arctic as much as 1500 years ago. According to that data, the Arctic is now warming faster than at any point in that 1500 year history. 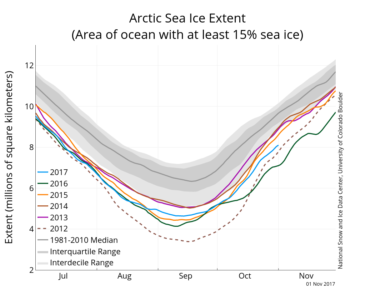 According to the International Arctic Report Card for 2017, multi year sea ice, sea ice over four years old, is now almost completely gone. Summer sea ice extent is declining, particularly in the regions North of Alaska. Primary productivity in the Chukchi and Barents Sea is increasing. Land in the Arctic, particularly in Alaska’s Brooks Range is getting greener, changing from ice and lichen based ecosystems to leafy shrub based ecosystems. These ecosystem and climate changes means that marine mammals of the Arctic must adapt. Polar bears are already having to go through longer periods of fasting. Walruses are now annually seen in tight concentrations on the small beaches of Point Lay Alaska awaiting the return of ice flows. 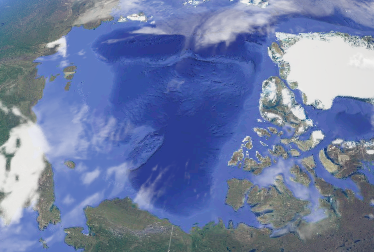 The Arctic Ocean will continue to be a biologically rich region, but it will be different. Some species will adapt and others will struggle. You may also want to check out the Highlights of the 2016 Arctic Report Card. For the Native Alaskan peoples living along the northwest coast Alaska, life and culture are deeply connected to subsistence through and on the ice. Although western foods are present, they are often very expensive and less desirable than traditional foods. Bowhead whales are hunted in spring and fall. Sheefish and seals are caught through the ice. For villages like Savoonga, Kivalina, or Shishmaref fall has always meant strong storms. Storms move up from the North Pacific Ocean as low pressure systems and intensify when mixed with cold arctic air. Historically, sea ice fixed to the coasts provided protection against the waves and storm surge that came with these fall storms. In the last decade, sea ice has come later. 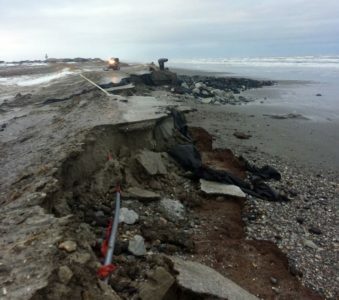 With no sea ice, fall storms have ravaged coastal villages along the Bering and Chukchi seas causing large scale erosion and damage to infrastructure. Although we don’t yet know what the exact effects will be, changing sea ice patterns will have an effect on the ability of Alaska Native hunters to locate and safely harvest seal, walrus, and other marine mammals. A warming Arctic threatens food in other ways. Traditionally, food storage cellars have been cut directly into the permafrost. When the permafrost melts, food storage cellars warm up and the risk for rot and food born illness increases. The loss of traditional storage to fish and game may lead to food insecurity. 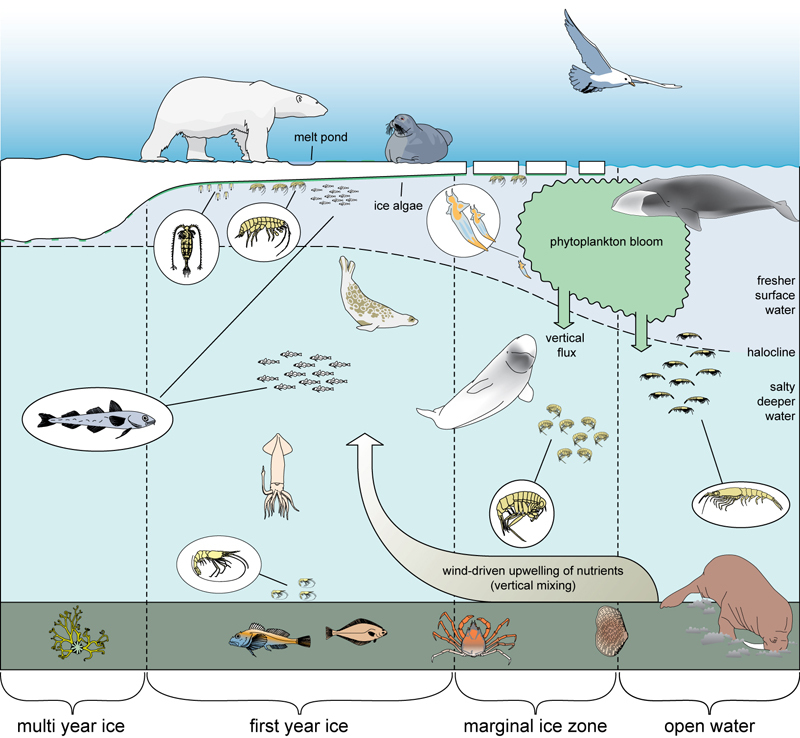 How is the Arctic marine ecosystem defined by sea ice? Use any one of these data visualizations to describe what has happened in the last decade to Arctic Sea Ice. Graph it yourself. Use your Google Sheets skills to build a graph. Be sure to include a trend line from the customize menu. Here is the data from NASA. Click here if you want to see what that looks like on an animated map. Check out the executive summaries from either the 2017 Arctic Report Card or the 2017 Arctic Report Card. Skim through this and describe two findings that either surprised you or interested you. Polar bears are often considered the poster child for negative effects of diminishing arctic sea ice. Describe how polar bears depend upon sea ice and what happens to polar bears during times of without sea ice. Describe how seals like ringed seals or bearded seals use sea ice? What risk does declining sea ice pose to ice dependent seals? How do walruses depend upon sea ice? What risk does declining sea ice pose to walruses? Describe how bowhead whales may be benefiting from the loss of sea ice? Examine some of the ways that climate change in the Arctic is affecting the lives of people living along Alaska’s north coast. Listen to a life-long subsistence hunter from Nome or read about the concerns of a mother for the future of her young son.